Hi, children here is an age old moral story for you. This is a story of a crow which acted smartly in the right way to find a solution for its problem instead of losing hope and crying without thinking for a solution. 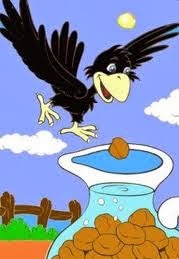 Yes you got it, this is the story of a thirsty crow or the clever crow. Once on a hot summer morning a crow was cawing out of thirst. It was feeling very thirsty, so it went on searching for water everywhere but could not find water anywhere. The poor crow was tired of searching for water in the hot weather. It lost all its energy and was feeling extremely weak. The crow continued to search without losing hope. After it searched and searched and searched, finally he found an earthen pot. The crow felt happy on seeing the pot. It went near the pot and peeped in. "Oops!, there is too little water in it and I can't reach the water. What should I do now?" thought the crow. The crow did not get disappointed but it started to think and think and think to achieve success in getting water. The crow saw many pebbles (small stones) lying on the nearby ground. Immediately, he got an idea. The crow started picking up one pebble after the other with its beak and dropped these one by one into the pot. The pebbles are heavier, so these sank to the bottom and made the water level to rise up and up. Finally, the water level rose to the neck of the pot and the crow's beak could reach the water. Dear children, what did you learn from this age old story? Can you tell the moral of the story? Moral of the story: Never give up in vain but keep thinking and thinking till you find a solution to your problem. Think and act cleverly.